Seapoint Boutique Hotel is in a quiet location on the northwest coast of Mauritius with a private beach facing the azure lagoon of Grand Bay. The hotel has been designed and decorated with great attention to detail and the result is a winning combination of paired-down style and easy barefoot living. Rooms and suites have whitewashed walls and furniture, with artworks and textiles in shades of turquoise and blue giving them a marine theme, further enhanced by the seaviews. All are en-suite and have air conditioning, so the interior remains cool even on the hottest day. You have a supply of hot and cold drinks that you can enjoy sitting on your terrace. The 2-bedroomed villa is perfect for a family (children aged 12 and over) or group of friends, having a lounge with an entertainment centre and a BBQ area for private meals. You have a choice of restaurants offering different dining experiences: Le Hublot is the architypal fine dining establishment and the more casual Beach Restaurant has tables on the sand within a few feet of the sea. Each has its own bar where you can relax and mix with other guests. There are loungers and sunshades on the beach and by the infinity pool, with beach towels provided for lazy days. There are lots of activities should you wish, including kayaking, diving and catamaran cruises, with bikes available for exploring on dry land. Staff are happy to arrange a myraid of excursions and activities, so you really can make your stay extra special. Spa therapists are available to administer massages and beauty treatments tailored to your wishes, leaving you feeling refreshed and rejuvenated. Open: Seapoint Boutique Hotel is open all year. Location: The hotel is on the northwest coast of Mauritius, near Pointe aux Canonniers. The hotel is 75kms from the airport. Rooms: There are 23 guest rooms split into standard and deluxe rooms, suites and a villa. All rooms are en-suite and air conditioned, have TV, phone, coffee and tea making facilities, minibar, safe, hairdryer, Wi-Fi (pay locally) and a balcony or terrace with sea views. The suites and villa are nearer the sea and have a bath as well as a shower. The villa consists of 2 bedrooms, 2 bathrooms, a lounge with home cinema, satellite TV and a bar, a kitchen, a rooftop terrace and a barbecue area. It comes with butler service. Activities: Swimming, windsurfing, dinghy sailing, kayaking and cycling are popular. The following are available and need to be paid for locally: waterskiing, parasailing, kitesurfing, catamaran cruise, speedboat trips, big game fishing, scuba diving and trips in the ‘Blue Safari’ submarine. The hotel has a selection of board games. The resort of Grand Bay and its shops, markets, restaurants and entertainment venues is just 4kms away. Staff can arrange island excursions by car and boat and activities including horse riding, ziplining and sky diving. Facilities: There are 2 restaurants, a gazebo for outdoor dining, and 2 bars including a beach bar. There is an outdoor freshwater swimming pool and deck, and the hotel has a small private beach with sunbeds and parasols. Beach towels are provided. There is musical entertainment on most evenings. The spa has 3 rooms for massages and beauty treatments, and a jacuzzi. The hotel has a boutique. Dining: Breakfast is served between 7am and 10:30am with a choice of a continental or cooked items. Lunch and dinner are a la carte meals. Children: Children aged 12 years and over are welcome. Health: This is not a malaria area. Notes: Over Christmas and New Year there is a 5-night minimum stay requirement. We know and love Mauritius, and would be delighted to help you plan your perfect trip here. 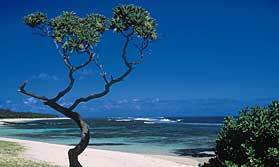 Let us help you plan your perfect tailor-made holiday to Mauritius. Talk to one of our travel experts. Tell us what you want, and we will tailor make your perfect trip.